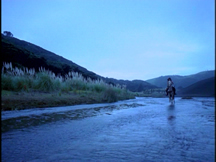 The West Coast of Auckland and more specific Bethell's Beach has been one of the most used and most beautiful film locations of Xena Warrior Princess. Also the Wainamu area with lake and dunes is one of the most devine place to film this spectacular and ever lasting tv-serie. The actors and film crew made history by making a weekly widescreen movie for television. And there was no better location then the West Coast of Auckland. As you browse through the pages you will find pictures versus screengrabs which shows you the film areas. But what you see is not always reality. Some locations are very well put together to get another background. We could find this out by being at those places. And it is so interesting figuring it all out and see how well this show has been put together. During our holidays in 2007 (honeymoon from 26/2/2007-23/3/2007) and in 2009 (14/2/2009 - 14/3/2009) we could cover, let's say about 90% of the outside film locations. Bethells Beach, O'Neill Bay, are the black sand beaches. The black sand is very fine and heavy due to it iron metal content. It is vulcanic. Touch and feel the weight and substance. Depending on the sun, the light, it might change colour from black to grey or some in-between shades. That way you can have scenes and pictures of the same location but due to the colour difference you become a total other feeling of the film moment. You only can have it here at Auckland's black sand beaches. Nature gave it all to produce this fantastic show. Be aware (not of the Greek bearing gifts) of the black sand at hot sunny moments. I was warned but I tried it anyhow as I'm used to the white sand. I can assure you that the black sand becomes very HOT. I never ran up the passing dune from Bethells to O'Neil bay in such a sprint. So don't be as crazy as I was and cover your feets. How to get there? You have 2 possibilities. First one: If you stay with Trude and John at Bethells Beach Cottages you have the devine access through a private track. You can go to the beach through the walking track of Xena's beginning of Ulysses. Yep, from the start you go in the Xena footsteps. And then enjoy the beach with its numberous places of Xena episodes. Second one : Take your car and take direction Swanson. From Universal road take Swanson Road. Keep driving straight ahead and the road changes into Scenic Drive. Scenic drive will take you also to other directions. At Scenic drive take right into Te Henga Road. Keep on driving straight ahead. Road changes into Bethells Road. You will pass 2 little bridges. Second bridge is the one where your track starts to Wainamu Lake and Dunes. But keep on driving and you end at the parking place of the surf club. From the surf club you have direct access to Bethells Beach aswell and you are immediate on the place where Caesar paid Xena his ransom in Destiny. From there you have at your left a total look out over Bethells Beach. Always be aware of the tides which are going quite fast. At low tide it is the best moment to go for a full Xena Visit. Use the Kiwimaps that you can buy everywhere. And take enough to drink and eat with you during your walks. Don't forget to cover your eyes with good polarised sunglasses.